We understand the frustration and aches that auto injuries can bring. That’s why we’ll schedule to see you the same day you call, so we can begin helping you right away. If you’ve suffered a traumatic accident, beginning treatment as soon as possible helps you achieve the best results. Our goal is to get you back to where you were before the accident (or better) so that you can do the things you love. It’s important to begin the healing process right away. We’ll address your aches, pains, whiplash, and other complaints. 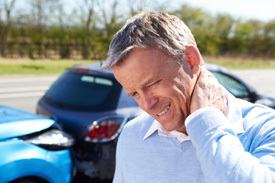 Injuries suffered in a car wreck can start the degeneration process in your spine. After a thorough evaluation, we’ll utilize a combination of specific chiropractic care, therapy, and exercises to help you regain strength and stability for a quick recovery. Dr. Nick and his staff have many years of experience dealing with auto accident injuries and working alongside lawyers. We work directly with the insurance company, submitting your claims so you can focus on healing better and getting back to your life. If you’ve been in an accident, we’d love to help ensure your recovery and help make this process easier with our knowledge and experience. Contact us and see how we can help.